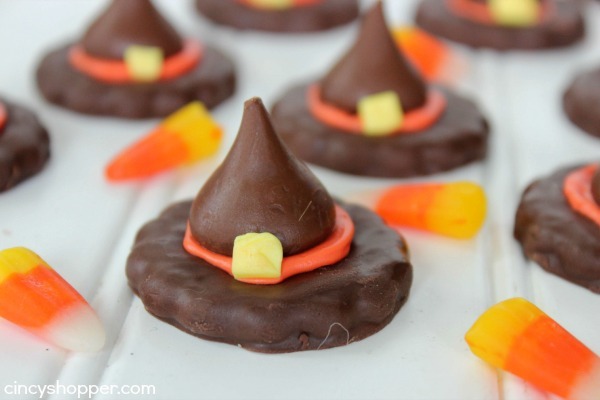 If you are needing a cute but simple treat for Halloween you will adore these Halloween Witch Hats Treats. 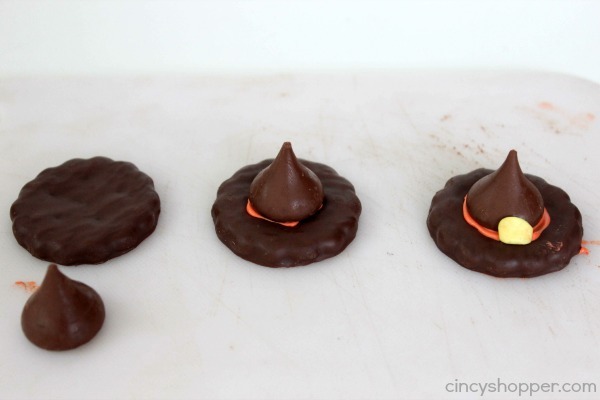 These treats are made with store bought cookies, Hershey’s Kisses and some simple icing. 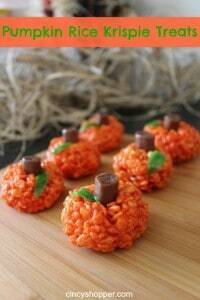 These are so simple and everyone has loved them at our past Halloween Parties. When Halloween party planning season arrives (that’s now for my family) we always get excited and have the tough decisions of what treats will be on the dessert table. Some years we do up a more spooky themes other times we stick with the cute treat ideas. When Cierra was in kindergarten these were her favorite treats to take to school to share with the class. Her little treats she shared were always a hit. I can not count how many times she insisted on being a witch for Halloween. I think she may have had a slight obsession, ha ha. 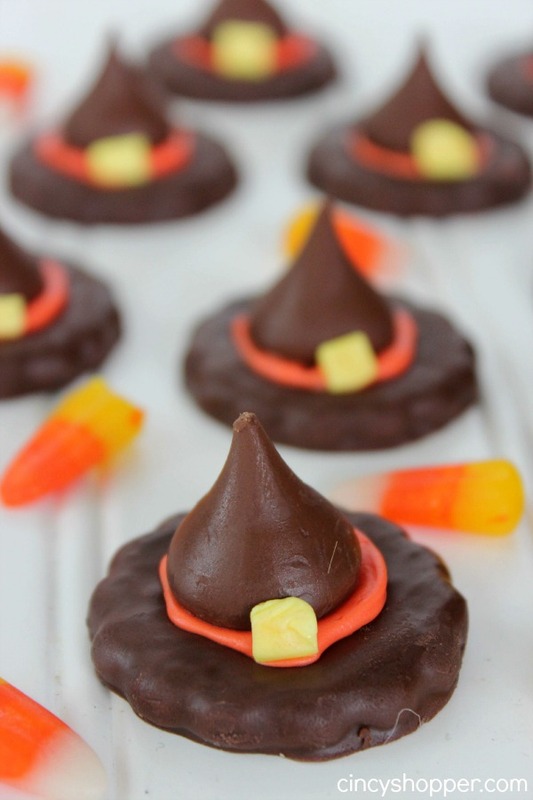 If you are needing a quick and easy Halloween Treat for a Party, just a season treat these Halloween Witch Hats Treats will be perfect. So simple too! 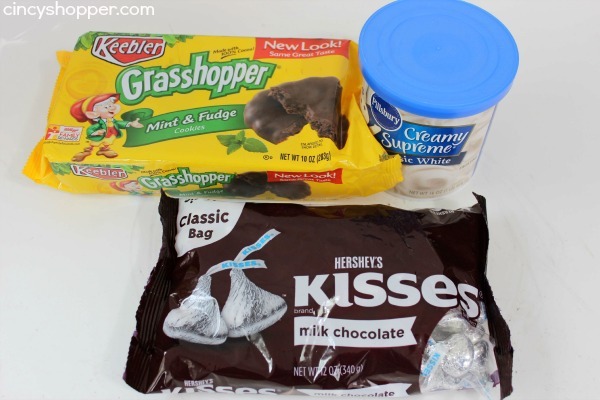 Just grab some Keebler Grasshopper cookies (or Keebler Fudge Strip work too), a bag of Hershey’s Kisses. Then whip up some orange frosting (you can also purchase pre-made) to whip up these cute Halloween Treats. Transfer icing to piping bag or zippered bag and clip a corner. If you are using cookies that only have one side fudge covered, make sure that side is facing upwards. Pipe icing in the middle to act as “glue” and place an unwrapped kiss in the middle. If you like you can pipe extra icing around the kiss to even up the look. I will be sharing some really fun Halloween Treat Ideas with you this year so be sure to check back. Last year I shared our Pumpkin Rice Krispie Treats with all of you and they have been VERY popular with readers and friends. You can either buy colored frosting or get a tub of white frosting and add food coloring. Pipe icing in the middle to act as "glue" and place an unwrapped kiss in the midddle. What do you use as the yellow buckle? 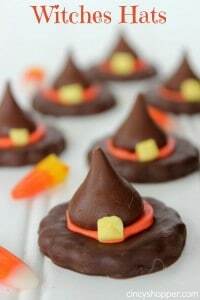 What to use for the Buckle on Witches Hats Cookies? Your Halloween Witch Hats look adorable! Hope you are having a great weekend and thanks so much for sharing with Full Plate Thursday. Beautiful, I will make it for my kids, thanks for sharing with Hearth and Soul blog hop. pinning. What do you use as the buckle? You could use the yellow part of the candy corn.. At least that is what I am going to try.